When New York-based coworking space operator WeWork set foot in Seoul in August 2016 with its first office in the affluent Gangnam-gu district, the staff’s main task was to overcome uncertainties in the Korean market, where the concept of coworking spaces was new. Two years later, WeWork Korea is on a roll, tasked instead with meeting soaring demand for easier and trouble-free leases. Masterminding the leap forward in Asia’s fourth-largest economy is Kang Dong-jin, senior director of real estate management at WeWork Korea. “Real estate market players here, especially landlords, were very quick to catch up with the latest trend,” Kang said in a recent interview with The Korea Herald at WeWork Seoul Station. For example, a quality commercial building may suffer a sudden rise in vacancy rate if a tenant that had occupied a large area vacates the building when its term ends. WeWork — a tenant that recruits other tenants — can provide a solution for landlords in such situations, Kang said. For instance, a new tenant, such as a private company, could face uncertainties over the future of its business, which makes it difficult to determine how much space it would need in the future. If the business of a tenant faces a crisis, it might need to shrink its office space, affecting both the tenant and the landlord. Conversely, a tenant’s success in business might lead to the need to expand its office space, but the building might not have available space left. 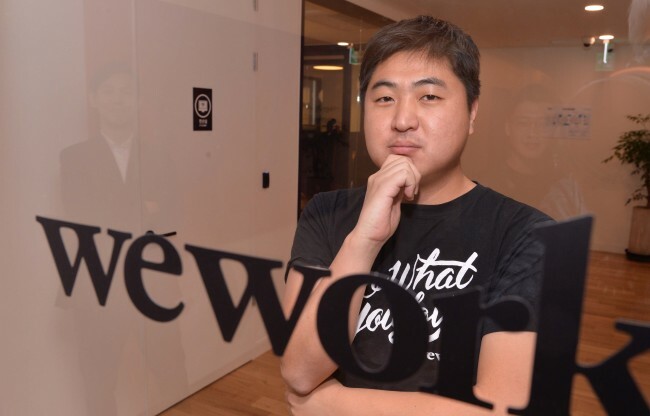 WeWork can provide such tenants with the chance to operate office space with high flexibility, so tenants do not have to take up extra space in a building while leaving it idle, Kang explained. Moreover, WeWork’s tendency to enter long-term contracts of at least five years could help both landlords and WeWork as a tenant, even in times of economic downturn, he added. “We invest money to spruce up facilities in the spaces we occupy, so there is no reason to make a short-term contract,” Kang said. Kang joined WeWork in July 2017 as a real estate management director. He was formerly at Singapore-based Ascott Limited and CapitaLand as a Korean asset investment manager, and Hyundai Engineering & Construction as a real estate development manager. Kang holds a master’s degree in business administration from UCLA Anderson School of Management. After establishing its third coworking space in Seoul in August 2017, WeWork quickly expanded to dominate the local market. The US firm seeks to gain an edge over local players mainly by acquiring spaces in landmark buildings, such as Seoul Square near Seoul Station, Jongno Tower in Jongno-gu district, Daishin Finance Center in Euljiro and Hewlett-Packard Korea Building in Yeouido. The coworking space market as a whole is seeing steady growth here. Conglomerates like Lotte and LG are emerging as new domestic players in the coworking landscape, in addition to domestic startups like Fastfive. The number of WeWork spaces in Seoul rose fivefold in 13 months to 10, capable of accommodating over 15,000 office workers as of November. By the end of February next year, Seoul will house 13 WeWork coworking hubs that will be able to take in at least 20,000 businesspeople. Seoul is also home to enterprise members — with over 1,000 employees — including General Motors Korea, SK Holdings and Amorepacific. WeWork is looking beyond Korea’s capital city. It plans to establish coworking spaces in three buildings in Busan by the first half of 2019. Busan, a port city some 320 kilometers southeast of Seoul, will be the second city in Korea where WeWork has landed. Kang has pinned high hopes on Busan as a potential hub for the “fourth industrial revolution,” saying he is confident of demand for coworking space in the city. During the interview, Kang said WeWork follows a rule of thumb in choosing a location — accessibility, the condition of the building and a landlord willing to build a partnership for at least five years. In addition, Kang said there is one specific approach in Korea — building interpersonal relationships with landlords. “Landlords in other countries would speak more of profits, but in comparison, in Korea, building good relationships with landlords potentially help in winning the next contract,” he said.